CS-Cart Module Float Stock allows you to sell products using float stock. It is usable for such products as cloth (meters), vegetables (kilos), gold (gramms) e.t.c. Placing qty label to such places as cart content, order details e.t.c. Sale Type is a setting that defines if product will sell as fractional amount or packs. When packs are selected is sells as integer, but shows an amount in one pack and total selected amount. You can set this value globally in module settings or for some product particularly. Also in this case, when add product to cart, value will be rounded to 1 sign after dot. 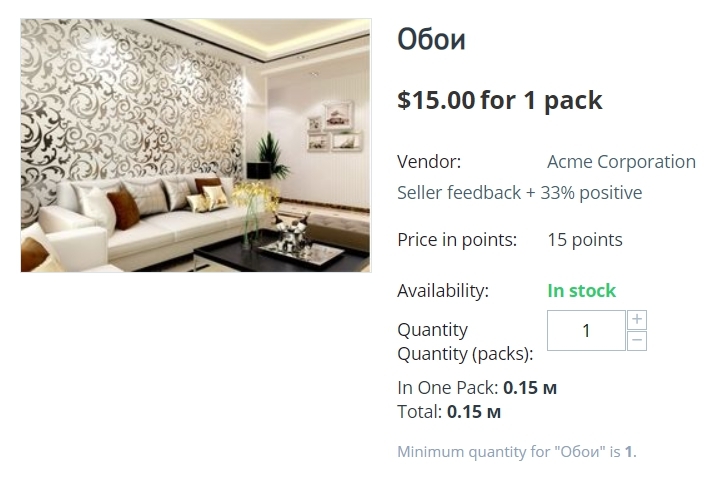 Product amount label appears near the label of the "Quantity" field at the product page. It could be set particularly for each product or globally using the product_amount_postfix_val language variable. You can set the minimum order quantity for that product as float number in the "General" tab. Also u can set this setting globally in module settings. You can import - export values of this modue using default CSV product export.